A clean environment is always something that is very nice, conducive, and healthy to live in, which is why we should always keep our surroundings clean as much as we can. But there may also be times wherein we don’t have a sufficient amount of time to do some cleaning, which is why we usually seek the help of cleaning service companies to do the job for us. But aside from just the lack of time, cleaning companies are also hired by companies to help them in cleaning their offices, or by tall structures that require specialized equipment just to be able to clean areas which are hard to reach or access. Today, there are already a lot of cleaning service companies in the market, which means a lot of competition for you if you are managing one. 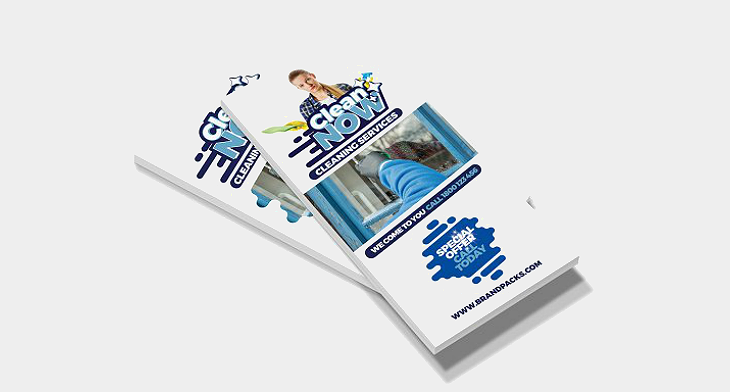 In order to stand out, you need to step it up when it comes to advertising your business, which means take advantage of flyers, brochures, and other advertisement tools. 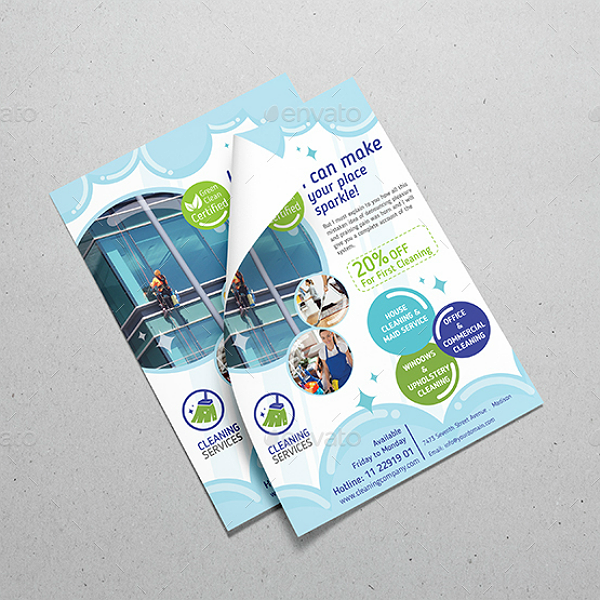 Here, we have a collection of rack card templates that you can also use to promote your business and the services you are offering. 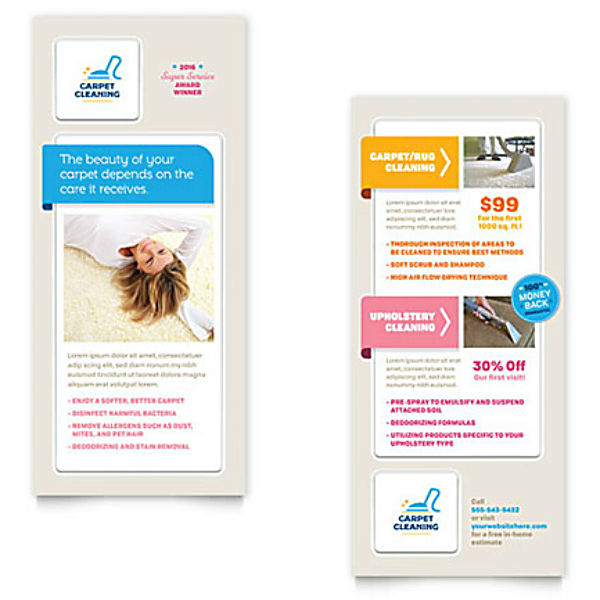 Check out the various rack card templates below when you’re ready. Above is an example of needing the services from cleaning companies to clean areas which are very hard to reach, and in this case, the outer surface of windows in buildings and other tall structures. While the inside can simply be cleaned by anyone without having to use any mechanized equipment, the outer surface will almost always require the use of harnesses or a motorized window cleaning lift. And since not everyone can or know how to operate these things, only professional window cleaners are allowed to use them because they are trained to do it. Other than just cleaning windows, cleaning service companies should offer a wider range of services which includes laundry washing and car services. But of course, some companies may need to start small before they can expand on their business and the services that they offer. 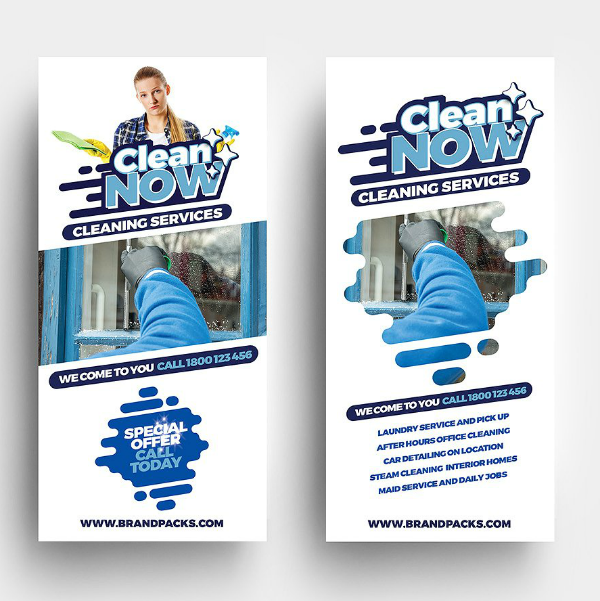 If you have just started your business, then it would make sense that your services are limited to office or house cleaning tasks, but after a while, you may want to expand on that and take advantage on the rack card template above to promote your new line of services. 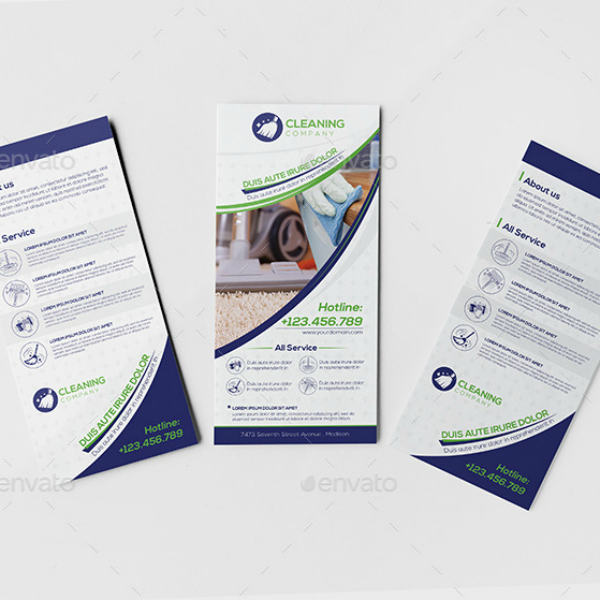 For as low as $9.00, why settle for less when you can get yourself an entire set of templates that you can use to promote your cleaning company? 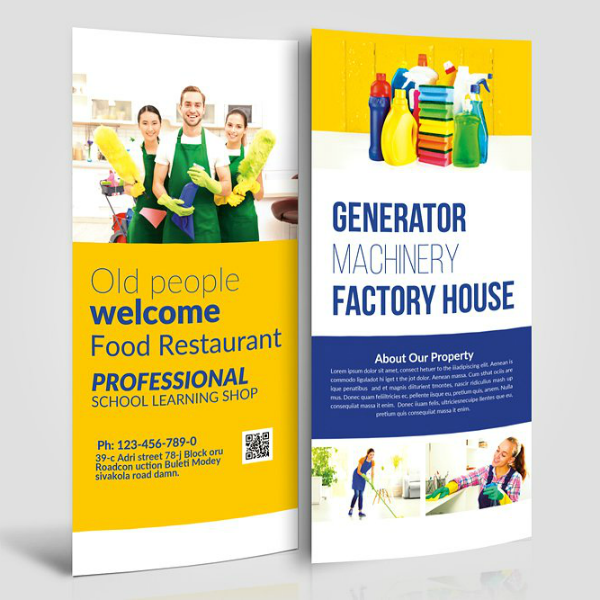 If you choose to download the bundled templates above, you will be getting not just a template for the rack cards, but also templates for making a roll-up banner, vouchers, and business cards. With this, you’ll be guaranteed to save up big time on your expenses, which is a good thing especially if you are still new in the industry. Get more for the price of one, how cool is that? Almost everyone is allergic to dust especially if it get breathed in, but there are also many other allergens present in a dirty home aside from dust. 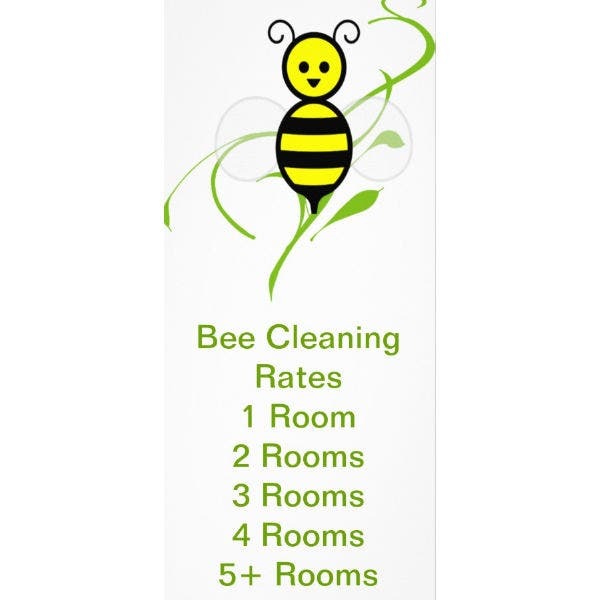 The best way to get rid of these allergens is the also the most basic and easiest to do, which is cleaning up the place. And after getting rid of all these allergens, there will be a lower risk of people developing flu, colds, and other respiratory problems. A dirty home is very likely to attract different types of pests, which is why it is very important to maintain cleanliness since it can also get rid of all the pests inhabiting those dirty areas. If you are able to get rid of all those pests, then you will also be able to minimize the chances of getting bitten by bugs and other insects and pests. Surprisingly, a clean home can actually help in relieving stress, because not only will it help you be able to find the things that you need in just a short time, but the positive image you see from cleanliness is enough to influence you emotionally and psychologically. Since employers are responsible for the health and wellness of their employees, maintaining a clean workplace can get you a head start at promoting good physical and mental health for your employees. Having a chaotic work environment can result in a chaotic psychological well-being, which in turn can result in low work productivity. Nobody would want to work in an office or any work environment which is cluttered and messy, and this is very applicable to those workplaces that have a lot of heavy machineries because it may lead to injuries or worse. As we have mentioned in the last bullet point, the employers are responsible for their employees, and this includes their safety. A clean workplace definitely looks trustworthy, and will motivate workers to perform at their best. Aside from just making your workplace trustworthy for your own employees, you should also make it presentable to your prospective clients and other business people who wish to collaborate with you. Impress them with how organized and professional your business is, and you’ll also be able to stand out from your competitors. If you own a carpet, then you know how tedious it is to getting it cleaned up. You can’t just sweep the dust off carpets, and you can’t mop them as well. While you can always have them washed, but if you own a huge carpet, then it would be a lot of washing, and we do mean A LOT! But then, there are cleaning service companies that specialize in cleaning carpets, they’ll vacuum and steam-clean your carpet to make it look and feel brand new. 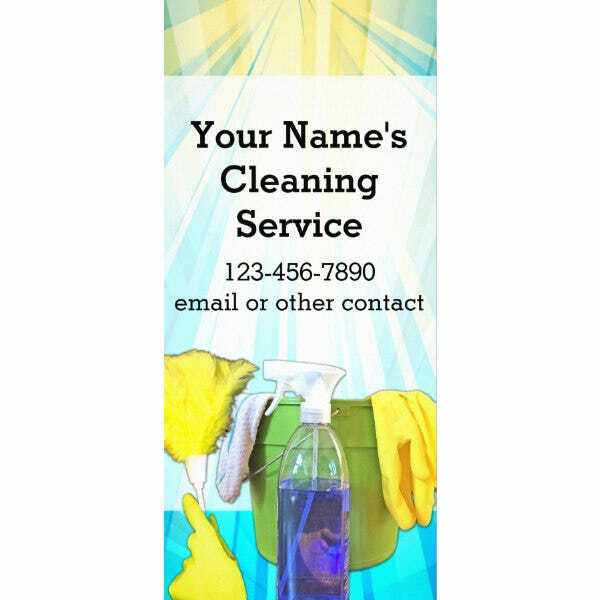 If this is the type of cleaning company that you are managing, then feel free to download and use the rack card template above. While cleaning is a task that can be learned by simply observing how other people do it, being a professional cleaner actually requires training. You may be asking yourself, “Training how to clean? What”, but it’s true. Training to become a professional cleaner means more than just learning how to properly clean the floor or any other surface, but it also tackles more complex tasks such as mixing cleaning chemicals and handling various machinery and equipment. 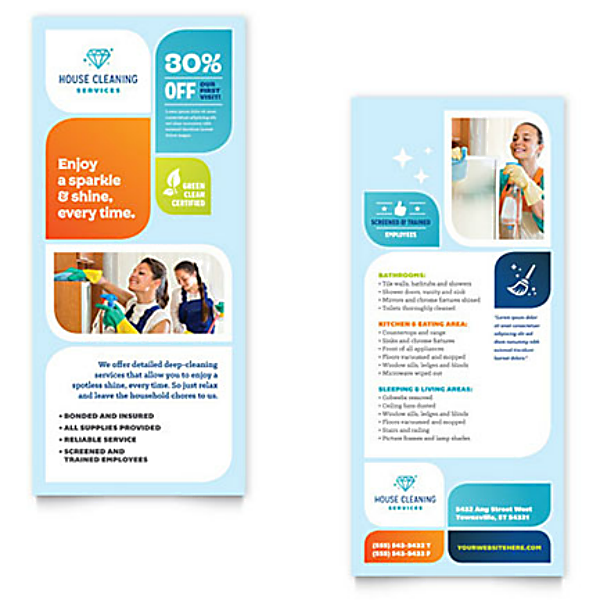 If you are a cleaning service company which also serves to conduct training seminars to those who wish to learn the professional way, then you may want to consider using the rack card template above. For the last and definitely not the least rack card template that we have on this list, we have one that is simple, clean (no pun intended), and very functional. When we say functional, we are actually referring to how organized the content is and how easy it is to read them while at the same time, being able to attract readers with its colors and images. If you look at the sample above, you will definitely agree with us when we say that this minimalist rack card can help you gain a lot of clients in no time. Now that you have gotten to the end of this short article, were you able to pick out at least one rack card template that works for you and your business? We sure hope you did since you won’t be able to find templates like these anywhere else except for the websites where we got these from. 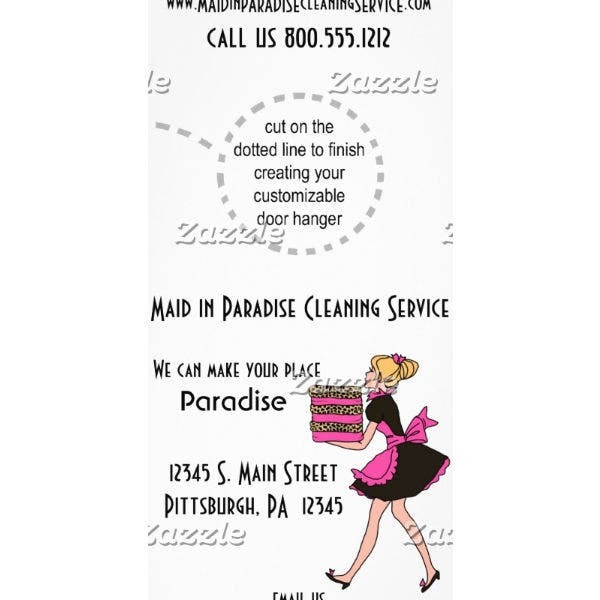 If you must know, these cleaning service rack card templates were designed by highly creative and artistic graphic artists from the entire globe, and these are guaranteed to have exceptional quality that will get your money’s worth. In terms of its other features, these templates are not only fully editable but they also allow you to isolate each element and edit them individually. The elements themselves are also fully editable and are scalable without causing any damage to the quality of the element. And lastly, with regards to the cost for downloading these templates, they are actually priced very reasonably, which makes them very ideal for promoting businesses. 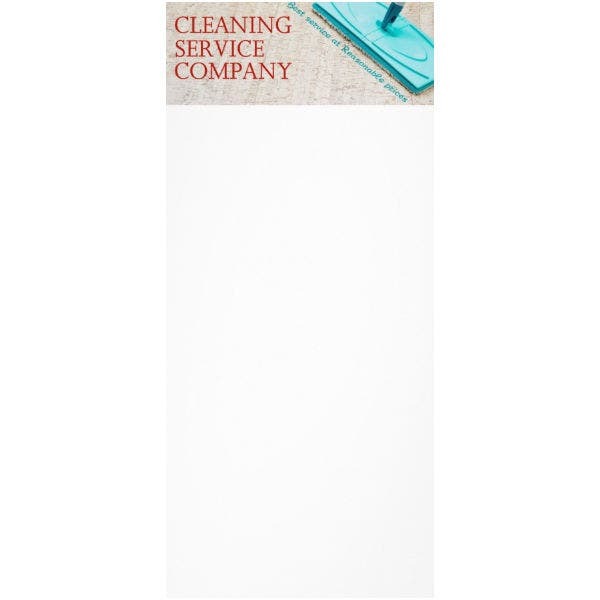 If you want to get started with your cleaning service rack cards, scroll back up and download a template now.